Cleansing the Temple: Is It About the Same as Cleansing our Hearts? Day Four of the Ten Days that Changed the World: Monday of Passion Week was a day of travel and cleansing, Mark 11:12-18. Jesus and the disciples walked from Bethany to Jerusalem and back. Remember, that’s about and hour’s walk each way, so these guys were in shape! We don’t live in an age of walking, but it gave life a different pace, and certainly provided time to talk, discuss and teach as people traveled. Along the way, Jesus saw a fig tree in the distance, and took his disciples over to find out if it had any fruit. Normally a fig tree shows fruit before it shows leaves, so if it has leaves without fruit, it is not going to produce any. Seeing that it was barren, Jesus announced that it would never bear fruit again. Many scholars see this as a prophecy against Israel. The reason Israel was chosen was to bear fruit, but their priorities had shifted, and they were depending upon the law and not God. They had Jesus in their midst and were rejecting him, so God was preparing a way of salvation “which shall be to all people”. Jesus had commanded them to “Produce fruit in keeping with repentance.” (Matthew 3:8, NIV). He also said, “Every good tree bears good fruit, but a bad tree bears bad fruit.” (Matthew 7:18, NIV) and “Every tree that does not bear good fruit is cut down and thrown into the fire. Thus, by their fruit you will recognize them. ” (Matthew 7:19-20) Bearing fruit is a direct result of where our hearts are, and hearts that need cleansing do not bear fruit. When people look at us, what do they recognize? What is YOUR fruit? The money changers also used a high exchange rate and dishonest weights and measures to change people’s Roman coin into Temple money. Perhaps since God called such dishonest scales “abominable” in Proverbs 20:10, Jesus was passionately opposed to such practices. “On reaching Jerusalem, Jesus entered the temple courts and began driving out those who were buying and selling there. 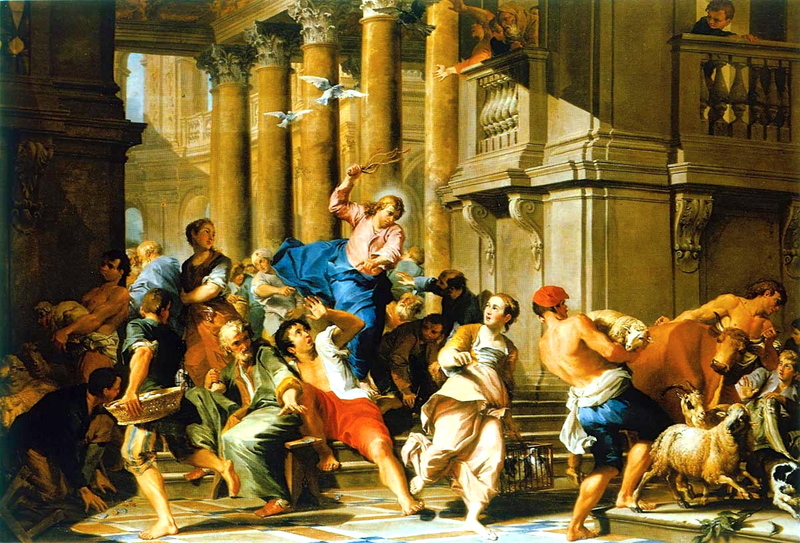 He overturned the tables of the money changers and the benches of those selling doves…” (Matthew 11:15). Jesus was fearless in confronting the corruption of the Temple system. Perhaps if he felt that the place where God resides should be cleansed and honest, we should feel that way today, too–but don’t forget that God’s residence is not in church, or in a temple, but in your heart. Are there any money changer’s tables you need to overturn? The synoptic Gospels (Matthew, Mark, and Luke; synoptic = “seen with the same eyes” since they used common source material) mention this cleansing event at the end of Jesus’ ministry, placed here during Passion Week. John’s Gospel, on the other hand, places a Temple cleansing at the beginning. Some scholars say there was only one event where Jesus cleared the Temple, and that John placed it at the beginning for theological reasons to emphasize the judgment of Israel’s corruption. I think there were two events, slightly different in scale and focus, calling attention to the hypocrisy in the Temple. In either case, the act of cleansing was significant socially, politically, economically and Spiritually. One happened at the beginning of Jesus’ ministry, and the other happened near the end–and whatever the circumstances, Jesus made it clear that he was calling out the corrupt and wealthy Sanhedrin for their greed and extortion. This second confrontation with Jerusalem’s “Mafioso” certainly helped bring matters to a head. Nothing stimulates criminal retaliation more than messing with their money. Monday’s events remind us that Passion Week took place in the real world, and when Jesus confronted corruption and hypocrisy, the people he exposed reacted just like people do today. Imagine disrupting the cartel’s operations, or taking half a billion dollars away from, say, a government-funded abortion mill. Reaction will be swift and hateful. In Jerusalem then, and in America today, if you want to truly understand people’s motivation, follow the money. A couple of things about this: Jesus was no effeminate milk-toast who merely preached about love. He was strong and passionate. Don’t ever think of him as weak, or merely as “gentle Jesus, meek and mild.” He was a courageous, powerful leader who fearlessly challenged corruption and commanded attention. Second, on this day Jesus announced his presence in the Temple based on righteousness, honesty, and protecting the helpless who came to worship. Nothing about him has changed since then. This entry was posted in Daily Devotions, Poetry, Thought for the day by admin. Bookmark the permalink.